The steel-hulled, diesel-powered yacht Aras was laid down on 19 March 1930 by the Bath Iron Works; launched on 8th December 1930; and delivered to wood-pulp magnate Hugh J. Chisholm on 1th5 January 1931. The U.S. Navy acquired Aras on 24th April 1941, and renamed her Williamsburg. The former pleasure craft entered the Brewer Dry-dock and Repair Co., of Brooklyn, on 23rd June for conversion into a gunboat. USS Williamsburg (PG-56) was commissioned at the New York Navy Yard on 7th October 1941.Williamsburgwas ordered to the Norfolk Navy Yard to complete fitting-out, arriving on 5th November. After final alterations, the gunboat departed Norfolk on 2nd December, touched briefly at Washington D.C., and eventually arrived at Halifax, on 6th December, the day before the Japanese attacked Pearl Harbour. Williamsburg remained at Norfolk into November undergoing conversion. The ship then sailed for the Washington Navy Yard where, on 5 November 1945, she relieved Potomac as presidential yacht and, on 10th November 1945, erstwhile gunboat was re-designated AGC-369. 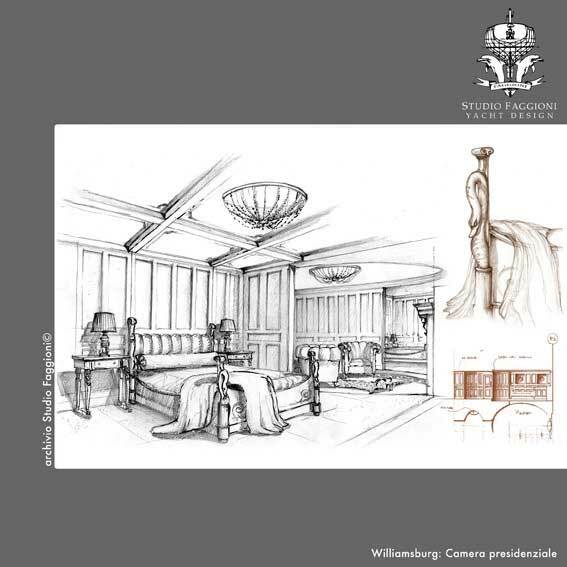 In the ensuing years,Williamsburg served two presidents, Harry S. Truman and Dwight D. Eisenhower. During President Truman's tenure, she embarked such American and foreign notables as Secretary of State George Marshall, President Miguel Alem?n of Mexico; and two successive British Prime Ministers, Winston Churchill and Clement Attlee. During the ship's first tour as presidential yacht, she cruised the Potomac River and Chesapeake Bay regions, while occasionally venturing into the open sea for cruises to Florida, Bermuda, Cuba, and the Virgin Islands. 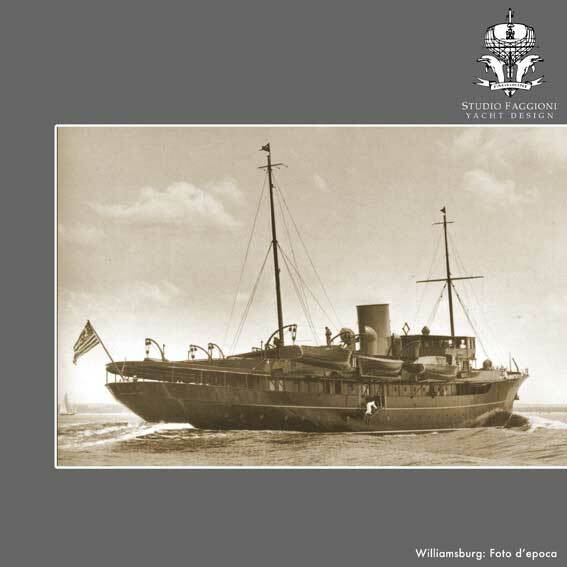 President Dwight D. Eisenhower made only one cruise in Williamsburg before ordering her decommissioned. He came on board at Washington on 14th May 1953 and cruised to Yorktown, Virginia, where he disembarked to visit the ship's namesake, the colonial city of Williamsburg. Re-embarking the Chief Executive at York town later that day,Williamsburg touched at Norfolk, Virginia, and Annapolis, Maryland, before she returned to the Washington Navy Yard to disembark the President on 18th May. 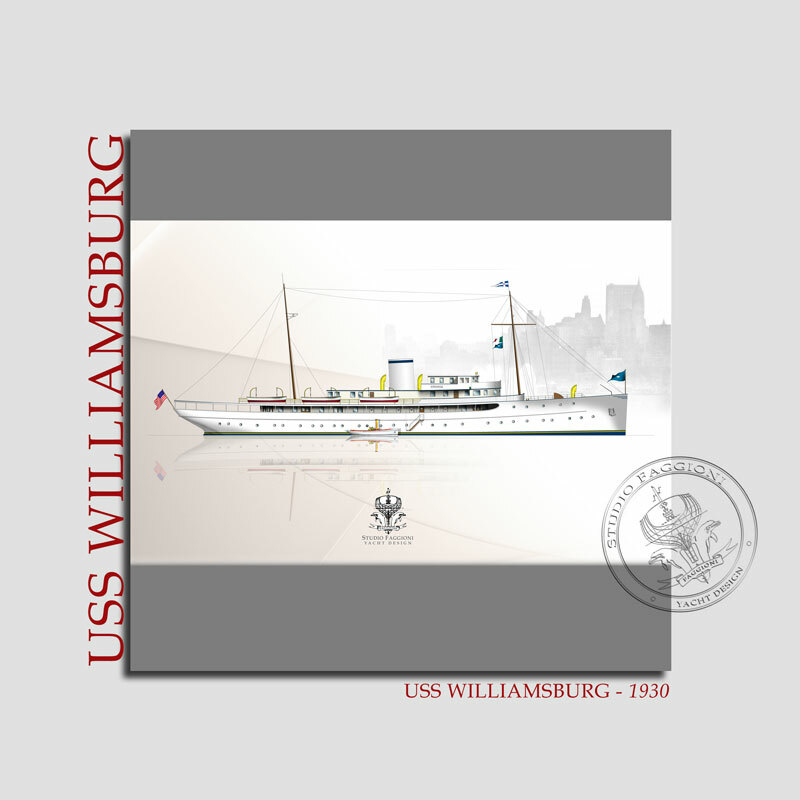 That proved to be Williamsburg's last cruise as a presidential yacht, because President Eisenhower directed that the ship be placed out of commission. Accordingly decommissioned at the Washington Navy Yard on 30th June 1953, she was turned over to the Potomac River Naval Command for maintenance and preservation. Subsequently shifted to Newport, Rhode Island, she remained in "special status" from about 2nd April 1959. Williamsburg was struck from the Navy list on 1st April 1962. 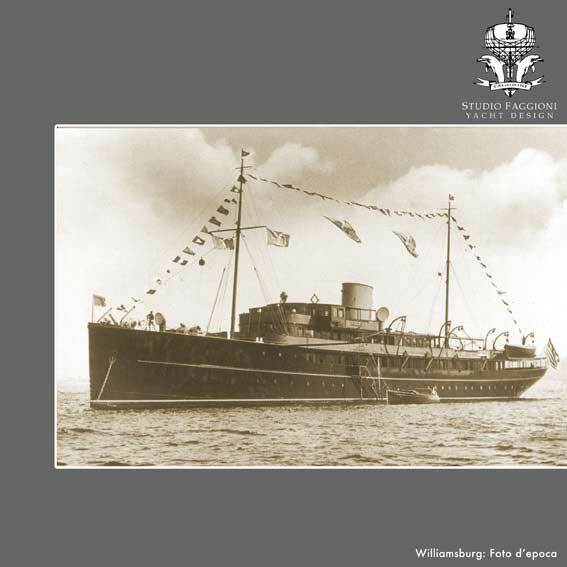 Williamsburg was transferred to the National Science Foundation on 9 August 1962, undergoing a change from presidential yacht to oceanographic research vessel at the Woods Hole Oceanographic Institute. 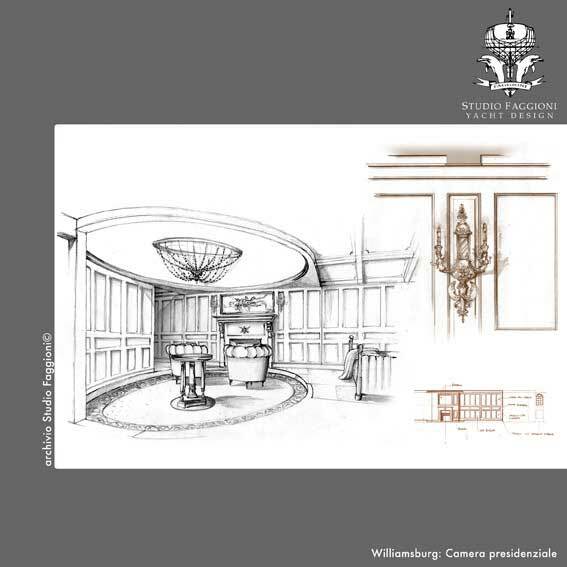 During the overhaul, the presidential staterooms and other yacht-like trappings were removed, and special facilities installed. Among the modifications was a seawater aquarium for preservation of live specimens and a lab equipped with microscopes and other instruments for examining and classifying samples of marine life. Two winches and a small crane were fitted for dredging and deep sea work, while a small side deck platform was added to permit long line fishing. The ship's engines, too, were reconditioned, and her bilge keels were modified to make the ship more stable. Renamed Anton Bruun, in honour of the noted Danish marine biologist, the ship made ten scientific cruises in the Indian Ocean, conducting broad sample studies of bottom, midwater, and surface life. She caught specimens of plankton; did long line fishing and trolling in deep water; conducted meteorological observations; and periodically obtained water samples. A multinational assemblage of scientists from the United States, India, Thailand, Brazil, and Pakistan worked on board the ship during this cruise. In 1968, while laid up for repairs in a floating dry-dock, the ship suffered extensive damage when the dry-dock sank unexpectedly. According to the book, Oceanographic Ships Fore and Aft, published by the Oceanographer of the Navy in 1971, Anton Bruunwas slated to be transferred to the Indian government. Restoration, in view of the apparent damage suffered in the dry-dock mishap, appeared uneconomical. Offered for sale by the Maritime Administration, the former gunboat, presidential yacht, and oceanographic vessel was acquired by a commercial concern whose intention was to use the ship as a combination floating hotel-restaurant-museum to be permanently berthed in Pennsville Township on Salem River, in New Jersey. Williamsburg was towed up the Salem River where she was placed in a berth originally meant to accommodate a dredge at the former Bright's Marina, renamed the Marlboro Marina. The shallow water depth resulted in the ship being firmly grounded in the mud. There the yacht remained in the southern end of Pennsville Township, in Salem County, NJ, and for several years thereafter as a restaurant before being sold to new owners. 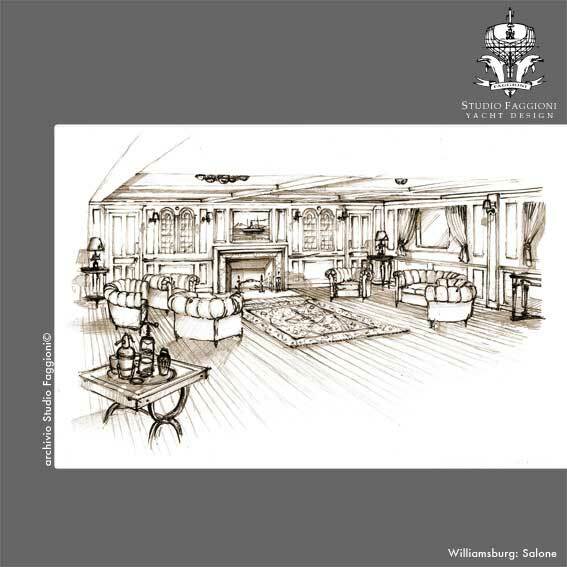 In 1993, the former Williamsburg was transferred to Genoa, Italy for conversion into a luxury cruise ship. These plans were never realized, and the former yacht was faced with imminent scrapping at La Spezia, Italy, but an urgent appeal to the Italian government saved her. 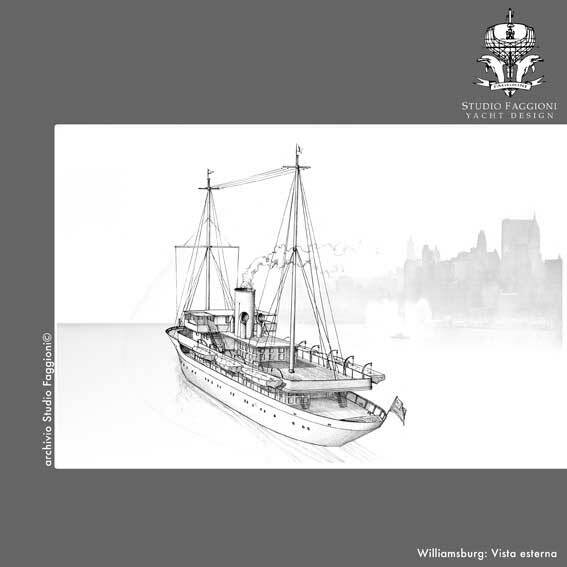 The "USS Williamsburg Preservation Society" was formed with the goal of returning Williamsburg to the United States for restoration and preservation. 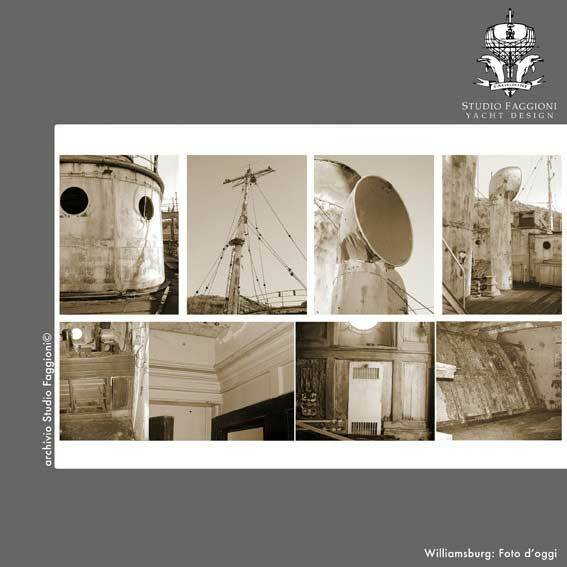 Studio Faggioni in La Spezia, specialized in restoration of classic boats, has made a complete preliminary project with general arrangement and suggestive perspective views. 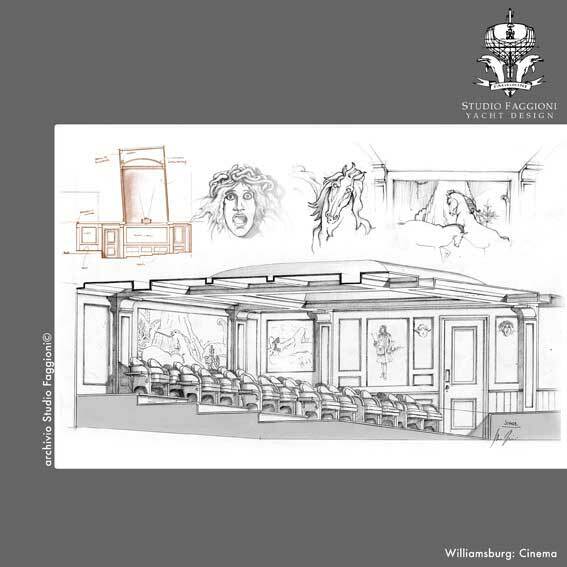 Williamsburg is currently laid up at the Navy wharf in La Spezia, Italy, and is offered for sale.